Carol and I recently finished reading Sheri Dew's new book, God Wants a Powerful People. We bought it when it first came out in October but only finished it just before Christmas. The reason it took so long is that I read it out loud to Carol a few pages at a time each night before retiring. In fact, I can honestly say that I put Carol to sleep each night by reading Sheri Dew. We enjoyed the book immensely. It is an enlargement of a previous talk she gave on the same subject, which we have on a CD and have enjoyed several times on various trips to visit far-away family. Sheri makes excellent points and illustrates many of them with great stories. I confess that I wish there were more stories because she really tells them so well. I have only one complaint about Sheri's writing style: Her chapters are sometimes too long. I like to read in small ten minute bursts - that's about all I get before Carol falls asleep. I think about five or six pages per chapter would be just about right. That way, reading aloud at two minutes per page gets you through one chapter before calling it a night. Carol knows I like books so she gave me a couple more for Christmas. 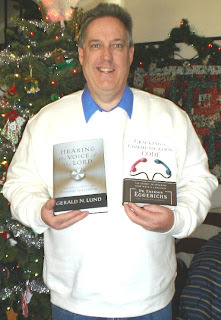 We just started reading Gerald Lund's new book, Hearing the Voice of the Lord. I immediately liked it as we started reading it aloud on Christmas night. Of course Elder Lund is a popular author with his Work and the Glory and Kingdom and the Crown series. But I compare this one to his earlier works. The Coming of the Lord by Brother Lund is a classic which I have read and referenced many times over the years. There are many other works that present the events of prophecy of the latter days, most notably Duane Crowther's Prophecy: Key to the Future. However, I have always felt that Brother Lund's book is 'safer,' leaving some of the interpretation to the reader. Now if you really want to read some interesting books about the events of the last days, pick up the Prophecy Trilogy by Anthony E Larson - "And the Moon Shall Turn to Blood", "And the Earth Shall Reel To and Fro", and "And There Shall Be a New Heaven and a New Earth." Now that has some great stuff that I've never read elsewhere about world-end cataclysms. But I digress...The point of this post is the offering of unsolicited advice and feedback for church authors from this particular reader. Make your chapters shorter. It makes for easier reading, better comprehension and especially discussion or pondering. Of course, this is all personal opinion. I also hate long paragraphs so take my advice for what it is - my personal preference. Gerald Lund's new book follows this pattern. The first few chapters are about five pages each. Then he begins to lengthen some of his chapters to ten, fifteen or twenty pages at the most. But most of them are in the five to ten page limit. I like that. I can handle that. It gives me time to digest and ponder what I have read before going on to the next concept in the next chapter. What do you think? Do you like short chapters and short paragraphs? If so, why or why not? I can provide more than a positive mention. I have always loved your books and have been fascinated by them since I first read them back in the 80's. I have a signed copy of your first book as a treasured part of my gospel library. I reviewed your website and your Youtube channel. I'm impressed. How about a blog? Yoor articles are fascinating. Where do you write and publish today? Shoot me your email address. I would like to do critical reviews of your books. Thanks for the comment.